It was 3 AM when the phone rang – it’s never good news at that hour. It was my father-in-law. A raging wild fire had sprung up out of nowhere and my in-laws’ home in Sonoma County was at risk. They were being evacuated. While their house was ultimately spared, neighbors just down the road weren’t so fortunate. The loss of life and property in and around Santa Rosa was incredibly tragic. Just when it seemed that Sonoma was on the road to recovery, the Santa Ana winds sparked a shocking replay of the scene here in Southern California. Again, there were evacuations, deaths and destroyed homes. In the days before Christmas, firefighters got the upper hand and displaced families were able to return home. Wildfires and earthquakes shouldn’t really come as a surprise to those of us who live in California, yet, when that phone call comes at 3:00 in the morning, it is still a shock. The advice we get is to “expect the unexpected” – to prepare by setting aside drinking water and shelf-stable food that might be needed in an emergency. There are parallels to the idea of planning for the aftermath of a natural disaster and being prepared in advance of an unexpected market downturn. For one, financial strength is a factor that is emphasized in our analysis of investments – I suppose that’s akin to having your home bolted to the foundation, a practice that reduces earthquake damage. At Poplar Forest, we also prefer companies that have sustainable free cash flow, which may be equivalent to those supplies of water and canned food. Finally, we use scenario analysis to examine how our investments will perform, not just in good times, but also in the equivalent of investment wildfire. Understanding the environment is important in assessing risks. For example, on the night the wildfires started, Red Flag Warnings were in effect. The National Weather Service issues Red Flag Warnings to alert fire departments about critical weather and dry conditions that could lead to rapid or dramatic increases in wildfire activity. At Poplar Forest, we watch valuation, investor sentiment and the term-structure of interest rates for clues about the riskiness of the environment. At this point in time, we don’t see indicators of a pending downturn, but risks are growing and we are watching for the sparks that could start a conflagration. I remain upbeat about the prospects for the stocks of the companies in which we are invested. I continue to have roughly 95% of my liquid assets deployed into the funds we manage here at Poplar Forest and the team and I are absolutely committed to a contrarian, value-centric investment process that we believe offers market beating potential in the long run. In thinking about the future, I think it can be helpful to reflect on the past as a way of helping widen our frame of reference in formulating an investment forecast. With that in mind, I offer a list of the developments that most surprised me in 2017.
Who knew a country could be governed via 140 character electronic messages? I had expected candidate Trump to evolve into a more traditionally styled president, but instead he has chosen to stick to the approach that got him into the White House. After a year in office, the stock market seems to have given America’s chief executive a vote of confidence while being seemingly unperturbed by his style of communication. I remember my father talking about how Kennedy was the first “television” president and from that time on, the skill with which politicians used that medium had a huge impact on their success. Perhaps Trump is the first social media president. Will Twitter and other social media platforms be as big for the next generation as TV has been for the baby boomers? President Trump seems to have met his match in verbal sparring partner Kim Jong-un. While the old adage “Sticks and stones may break my bones, but words will never hurt me” may well apply to Twitter feeds, recent rhetorical dust-ups feel more dangerous. Those intercontinental ballistic missiles are really big sticks. Observers continue to sound surprised at the advances made by Pyongyang, but so far, investors have shrugged off both words and threatened actions. Geopolitical tensions exist well beyond the Korean Peninsula and include the South China Sea, the Middle East where Saudi Arabia and Iran seem to be increasingly at odds, and Russia. We can all hope that cool heads prevail in all these situations, but each certainly offers plenty of material that could flare up at any time. Stock prices made strong gains in 2017 despite the aforementioned geopolitical tensions, two indictments and a guilty plea in the ongoing Special Counsel investigation of the presidential election, rising short-term interest rates, a flattening yield curve, and a growing federal budget deficit. The rate at which stock prices rose outstripped earnings increases and the market now stands at a decade high forward P/E ratio. I view valuation as a measure of sentiment and today’s high P/E ratio suggests that investors feel better about the future than they have at any time in the last ten years. As the great John Templeton said, “Bull markets are born on pessimism, grow on skepticism, mature on optimism and die on euphoria.” I believe we are well into the optimism stage, but I don’t yet see signs of euphoria in the stock market. Like the Energizer Bunny, stocks continue to keep going, and going and going. We’ve now gone more than 22 months without a correction of at least 5%. With the market grinding higher and higher, month after month, there has not been the type of routine setback that I find critical to the market’s health. We all need an occasional vacation, yet the S&P has not taken a pause to catch its breath since making a short-term low back in February 2016. Also notable: the S&P 500 produced a positive total return in every month of the year – something that has never happened before, according to Evercore ISI research. As you can see in the Appendix, in the nearly nine years since its early 2009 bottom, the S&P 500 has advanced from a closing low price of 677 to a high of 2,690 – a gain of almost 300%. Along the way, the market has had a correction of 5% or more 15 times, and three of those corrections have exceeded 10%. These sorts of declines were fairly routine – generally twice a year. While I don’t expect a bear market in 2018, I do expect higher levels of volatility to return; we may hold a little extra cash in our portfolios with the expectation that healthy corrections may provide attractive investment opportunities. I’m reminded of the quip: Economists were created to make weather forecasters look good. Models that predicted accelerating economic growth and rising inflation as a result of extraordinary monetary stimulus provided by the Federal Reserve have proven unreliable, to say the least. With the unemployment rate at an historically low level, wage inflation should also be kicking in by now, yet the official statistics show little progress. I believe the status quo is unsustainable – either job growth will slow or wages will rise. The President and Republican controlled Congress notched their first legislative win in December with a bill originally touted as tax simplification. It doesn’t look simple to me and this new law will certainly create lots of work for accountants and tax planners. While I have long believed that the U.S. needed to get its corporate tax rate down to an internationally competitive level, I did not expect such a far reaching and costly legislative re-write. The economy has been doing well of late and this feels like the wrong time to add more fuel to the economic fire. When times are good, I think it wise to save for a rainy day; this legislation goes in the opposite direction. At the beginning of the year, 10 year U.S. Treasury bonds yielded 2.45%. Since then, the Fed has begun to slowly sell its bond holdings while raising short-term interest rates four times (by a cumulative 1.0%). The economy continues to be strong and Congress just passed a tax cut that is expected to add $1.5 trillion to the budget deficit over ten years in the hopes of accelerating economic growth. Despite all this, bonds yields ended the year roughly unchanged in what seems like a repeal of the laws of supply and demand. The art market was abuzz this year given a new record price for a painting – the $450 million purchase of Leonardo da Vinci’s Salvator Mundi. This new record price was more than twice the $179 million high water mark achieved by Picasso’s Les Femmes d’Alger in May 2015. Collectible cars are also in record territory according to the Hagerty Blue Chip Index, which measures the values of the 25 most sought-after collectible automobiles of the post-war era. Collectible cars escaped the Great Recession and current prices are up almost five-fold since early 2007. The gains in art and cars pale in comparison to the red hot cryptocurrency market. In talking about bitcoin, some observers, including Jamie Dimon, the widely respected CEO of JPMorgan, have used words and phrases like “bubble,” “fraud,” and “worse than tulip bulbs” – a reference to the 1600’s mania perhaps best described in the book Extraordinary Popular Delusions and the Madness of Crowds, by Charles Mackay. For me, bitcoin is a bit like gold (or art or fancy cars) – I do not have a way to determine a fair value for these assets because they produce no cash flow. In fact, when storage and insurance costs are considered, assets such as gold, art and cars could be seen as generating negative cash flow. One of the only ways to make money in these assets, or in bitcoin, is by selling to someone else at a higher price than you paid. Because of this dynamic, I think of all these assets as speculations as opposed to investments. At Poplar Forest, we invest. If you had told me that in 2017 stock prices would be up more than 20% and that the price of oil would rise by more than 10%, I would have felt confident that the stock prices of energy companies would have done quite well. It didn’t work out that way- as a group, energy stocks fell in 2017. While investors appear optimistic about the outlook for stocks more generally, as expressed in a decade-high P/E ratio (see surprise #8), they appear less enthused about the outlook for energy companies -despite rising commodity prices and management pledges of more shareholder-friendly capital allocation plans at many companies in the oil patch. While I’ve been frustrated by the performance of our energy investments this year, we continue to believe that our holdings will deliver market-beating returns over time. I had believed that strong performance in 2016 signaled a new market environment in which value strategies, like those pursued at Poplar Forest, would generate years of market beating performance. The economy has been strong and that is usually a recipe for better value stock performance, but such was not the case in 2017. In fact, growth closed last year’s performance gap and more, thus continuing its pattern of outperformance over the last decade. In my experience, trends like this don’t continue indefinitely and I believe a cycle of outperformance by value strategies may be right in front of us. Historically, when value stocks have produced better returns than the shares of growth companies, our portfolios have produced even better returns. Question: Jon, are you saying a bear market is coming? His reply: No, I just wanted to share some data with you. Question: Jon, if there’s a bear market, what will cause it? Question: What sort of surprise? Reply: A surprise, by definition, is something you don’t see coming. By sharing this story, I don’t mean to suggest that a bear market is coming. The data Jon shared with us showed that the trailing ten year return of the S&P 500 was one of the best ever – on the order of 15% per year. By comparison, in this current cycle, the trailing ten year return for the S&P 500 is just 8.50% as of Dec. 31, 2017. Assessing risk is always a part of our process, but it is also a double edged sword. While many people seem to mentally insert “downside” ahead of the word “risk,” it is also important to be cognizant of upside risks as well. For example, while my list of geopolitical and inflationary worries has grown, I also recognize that the final stage of a bull market can often be the most profitable for investors. Getting too cautious too early can create meaningful opportunity costs. In the 24 months leading to the peak in 2000, the S&P 500 produced a nearly 40% total return; in the two-year period before the 2007 peak, the gain was well over 30%. Fortunately, my job isn’t to make top-down predictions about the economy or the stock and bond markets. I remain steadfastly focused on seeking to build, from the bottom up, a portfolio of investments that will produce market beating long-term returns. 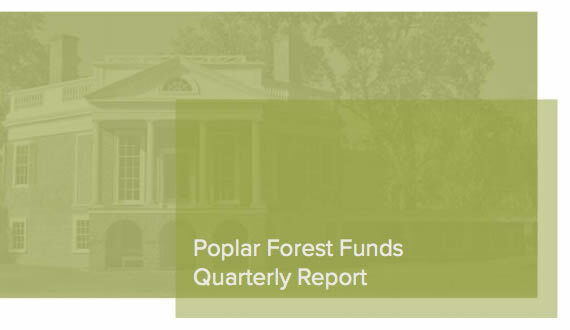 At the end of the year, the Poplar Forest Partners Fund held 28 investments. At a time when the median stock in the S&P 500 is valued at 20-21x earnings, our 28 stocks are valued at 16-17x. Furthermore, given that a number of our investments are currently generating what we believe are below normal margins, improved profitability could result in an even bigger valuation discount. We typically hold about 30 investments, but, in my opinion, selectivity is the name of the game at this point in the market cycle. In addition to being increasingly selective, we have cash equal to about 5% of assets, as I suspect a return to more normal levels of volatility may provide us opportunities to make purchases at what we hope will be temporarily discounted prices. If, however, the market continues its Energizer Bunny routine with continued correction-free advances, then our cash position may grow, especially if individual investments appear to offer less compelling risk/reward ratios. As a point of reference, if we thought market risks had grown to worrisome levels, our cash position could approach 25% of our portfolios. Our working assumption may best be summarized as: steady as she goes. The economy looks strong with near record low levels of unemployment, high consumer confidence and optimistic business sentiment. Regulatory reform and the impact of pending tax cuts seem likely to add to the positive drivers of economic growth. Earnings growth will likely be strong in 2018, and in my experience, stock prices follow earnings. While we may be entering the later stages of this market cycle, my worry at this point isn’t about a looming recession – – it’s about the economy getting too hot. In the short term, hot is usually good for stocks and bad for bonds and we are positioned accordingly. We will continue to watch for signs of two Red Flag Warnings, in particular: euphoria and an inverted yield curve. But barring a surprise, we believe the forecast looks great. Poplar Forest Capital opened its doors a decade ago. What a decade it’s been – from the bursting of the housing bubble and subsequent financial crisis on one end, to the first year of President Trump’s presidency on the other. We’ve seen groundbreaking healthcare legislation and historic tax reform. The S&P500 Index fell over 50% in our first 18 months of operation and then subsequently rallied to new all-time high levels. Through all the ups and downs, I’ve been fortunate to work with a great group of outstanding professionals. As we head into our second decade of work on our clients’ behalf, we are pleased to announce that we will be joined by two new team members. Nick Wells, CFA, joined us after spending the last four years as a research associate at the Capital Group and his primary focus will be the consumer sector. Nick received a Bachelor in Business Administration, with honors, from Texas Tech University in 2006 and a Master in Business Administration from the New York University Stern School of Business in 2012. Brian Haskin has taken on the role of director of business development and is responsible for managing and directing the firm’s sales, client service and marketing activities. Brian has spent 24 years in the investment management industry specializing in distribution, product development and investment strategy across both traditional and alternative investment products. He earned his Masters of Business Administration, with honors, from the Booth School of Business at the University of Chicago, and a Bachelor of Science degree in Business Administration from the University of Southern California. Please join me in welcoming these two talented professionals to Poplar Forest! Performance data quoted represents past performance; past performance does not guarantee future results. The investment return and principal value of an investment will fluctuate so that an investor’s shares, when redeemed, may be worth more or less than their original cost. Current performance of the fund may be lower or higher than the performance quoted. Performance data current to the most recent month end may be obtained by calling 877-522-8860. Opinions expressed are subject to change at any time, are not guaranteed and should not be considered investment advice. Holdings and allocations are subject to change at any time and should not be considered a recommendation to buy or sell any security.